Houghton Mifflin Harcourt, 2014. 292 pages. Biography. David MacLean wakes up one day on a train station platform in India. He doesn't know who he is or why he is in India - or even why he is at a train station. Plagued with hallucinations, paranoia, and severe depression, MacLean struggles to reconstruct his forgotten life after a serious reaction to a common anti-malarial drug causes severe amnesia. I picked this up because the concept sounded intriguing - who doesn't want to read about amnesia? (Every author falls back on amnesia as a plot at some point, after all.) 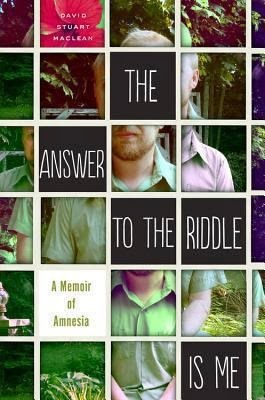 This is a heart-wrenching account of the realities of amnesia, told in startling detail. MacLean is very open about exactly how he felt during the first years of his new life, addressing his confusion and vulnerability fearlessly. But what I loved most about this book was the writing itself. MacLean is a novelist, and it shows even in a nonfiction work. The book reads very much like a novel - the prose is bright and vivid, and he uses common fiction tropes, like shortened chapters to lend a feeling of the episodic nature of his early awakening in amnesia, that make it a much less dense read than many nonfiction books. Beautifully written and eminently readable. I similarly picked up this book because I was intrigued by the concept. This is one of those books that changes my view and understanding of people because reading about these situations lets me experience them vicariously. I've never personally experienced hallucinations and paranoia the way MacLean describes, but I occasionally come into contact with people who do, and my level of compassion for them has significantly increased. I agree that MacLean's writing background makes this feel very novel-like, but with one major difference: He, the main character, is a real, imperfect human being with weaknesses just like the rest of us. That is clear. He's the protagonist you want to root for, but sometimes his decisions aren't what you'd hope or expect from a fictional character, which is exactly right. He's not a perfectly crafted character. He's real and sometimes makes decisions you wish he didn't, and that's that, sometimes leaving both him and the reader regretful. That being said, I appreciate this because of his straightforward honesty. No glorification or glossing over the hardest parts, just stark honesty. Well done.